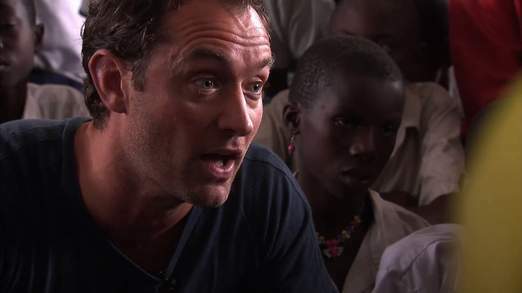 Jude Law is known widely across the world for his work in film but his humanitarian side is also very commendable. Over the weekend, the BAFTA winner was in the Democratic Republic of Congo to support Jeremy Gilley’s ‘Peace One Day’ project. While in the DRC, Law visited a United Nations Camp for people displaced by the war at the DRC. In an interview with Sky News, he said he was overwhelmed by the suffering of the people. Speaking to the children he met, Jude Law said he wants to tell the world about the children and their story. In 1999, Jeremy founded Peace One Day, a non-profit organisation, and in 2001 Peace One Day’s efforts were rewarded when the member states of the United Nations unanimously adopted the first ever annual day of global ceasefire and non-violence on 21 September – Peace Day. Peace One Day was celebrated with a high-profile concert headlined by 5-Time Grammy Award-nominated recording artist, Akon at the Goma International Airport. Film Review – God Calling: A movie about faith, with many unanswered questions. Film Review: Unfortunately, Lara missed the Beat. Aftermath of the Aba Women’s Riot: Where are the women?